The indoor Cyclamen otherwise known as the Florist’s Cyclamen is truly a special looking houseplant, the flowers are not only striking, pretty and colorful but full of poise and elegance. Oh yes, we’d agree completely that there are many other houseplants which have unique and interesting blooms that warrant a place in our homes, but the Cyclamen, with it’s upswept petals holds a special captivating charm. Perhaps it’s the Ballerina of the plant world – with it’s petals frozen still as if caught in a graceful dance. Subtly it attracts attention and is usually perfectly offset by the patterned foliage below, providing several months of interest. This is another bulb, or rather a tuber / corm, that in many cases belongs outdoors in the hands of a gardener. 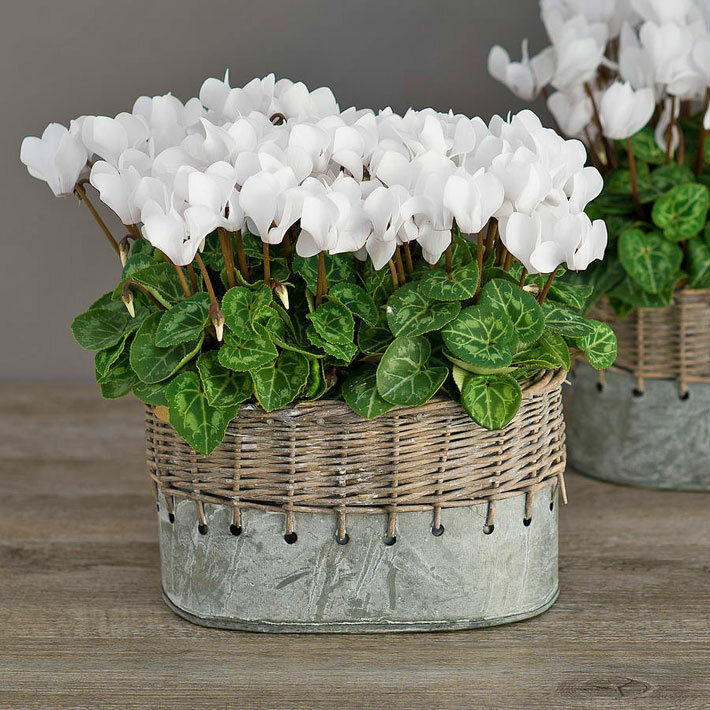 Although it’s true that a Cyclamen can’t live all year indoors, it can still easily become a temporary indoor plant which is welcomed into homes and offices during the Autumn and Winter months of the year. When things warm up, the plant retreats back into the tuber and completely disappears, by late Spring it’s all but a distant memory. Fortunately at this point however a tuber by itself is small and requires very little from you until early Fall / Autumn when it will burst back into dance and shower you with a constant display of blooms all over again. This means on the whole it’s easy to keep indoors providing you make sure it’s kept cool and well watered, if it’s too hot or too dry you’ll spoil your Cyclamen. We’ll talk more about this further into our article. The prices and types of Cyclamen are quite universal, in that they tend not to be overly expensive and almost all for sale are Cyclamen persicum. However there is still plenty of individuality to be had because the colours you can pick from are varied and there are three groups of sizes from the larger standards to the tiny miniatures. The leaves are frequently patterned differently too, so although you may only be able to find one main variety the choice is still extensive. Care is quite easy, and after flowering is finished you can either plant your tuber outdoors or store it for next Winter. Bright light away from direct sunlight is essential for a Cyclamen if you want a continuous long lasting flower display. If conditions are too dark the blooms are more sporadic and if things are too bright the flowers and leaves can become faded. Whilst your plant is growing, constantly moist soil should be your goal. That doesn’t mean you should over water or drown your Cyclamen, if you do there is a high risk the tuber will rot. Letting the soil dry a little is fine, but it should never be allowed to dry out completely whilst in growth. Most Cyclamen’s don’t get on well in conditions where the air is dry. It tends not to be the dry air that’s the problem but the often associated warmth that comes with it. Dry air tends to occur in centrally heated rooms or offices, near fires or next to hot electrical goods. A Cyclamen therefore is probably not the best plant to have in your front living room on top of your TV set with a fire roaring nearby. Pebble trays or grouping plants together are all simple ways to increase humidity levels if it’s needed. 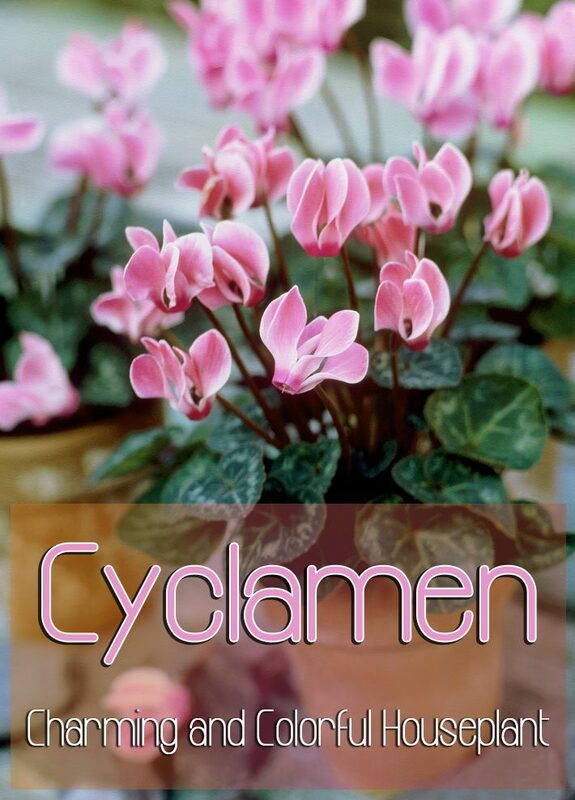 Never feed a Cyclamen unless it’s actually “active” or growing. Despite some recommendations, you should not feed or “soak” a Cyclamen tuber with fertiliser at any time. Instead feed your plant, if you want to, just before it starts to flower and during the display, this will encourage strong and potentially more blooms. A normal houseplant feed is suitable and just a small amount every two or three weeks is enough. The majority of Cyclamen’s sold are not truly frost hardy. Expose them to harsh punishing frost and they will suffer. That said, as far as “houseplants” go, the Cyclamen will take a real pounding from the cold before dying off when compared to many others, so could suit a porch for example. Of course, such cold conditions don’t occur in the living areas of a normal home so instead your primary concern should be the other end of the scale. Heat. Too much heat and your Cyclamen will expire quickly. 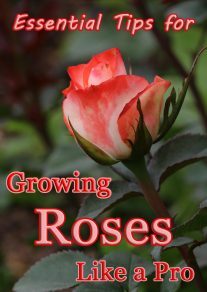 They will give a miserable performance, become quite ugly looking and the flower season can be cut from a month or two down to a matter of weeks. 16 °C / 60 °F or a little below this is the perfect temperature for indoor Cyclamens. Repot in August time using a standard potting mix, just before the tuber starts to sprout new leaves. If sprouting has just started you can still repot, but if you have fully formed leaves or flowers give it a miss and wait to next year. You can attempt to divide your tuber, but this is quite risky and probably left to the expert. It’s the same as a potato (also a tuber), if you imagine that when you cut the potato in half you expose the inside which would be susceptible to rotting and therefore makes it a gamble in the hands of an amateur. If seeds are produced you can try and grow new Cyclamens from these, however the conditions need to mimic outdoor temperatures and it’s quite a fussy process. It’s normally more cost effective to buy new plants instead. As with many bulbs or tuber plants, growth can be explosive and fast. A huge amount of energy is stored within the tuber and when required it can be used quickly resulting in rapid growth. 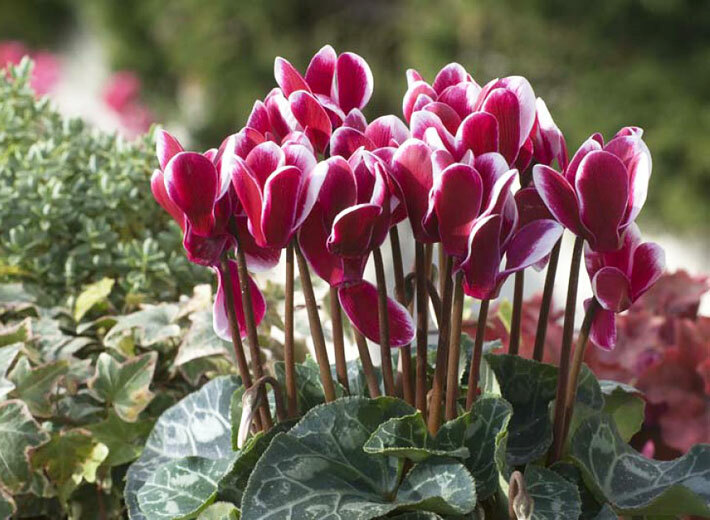 Your Cyclamen will belong to a size group (see below for more information on this) and the growth will continue until its final size has been reached. Once achieved its focus will be on the flower production. There are typically three groups a Cyclamen can belong to when it comes to size. Standards – growing up to 30cm / 1ft. Intermediates which come in at 20cm / 8in and the Miniatures which as the name suggests are the smallest, growing no more than 15cm / 6in. 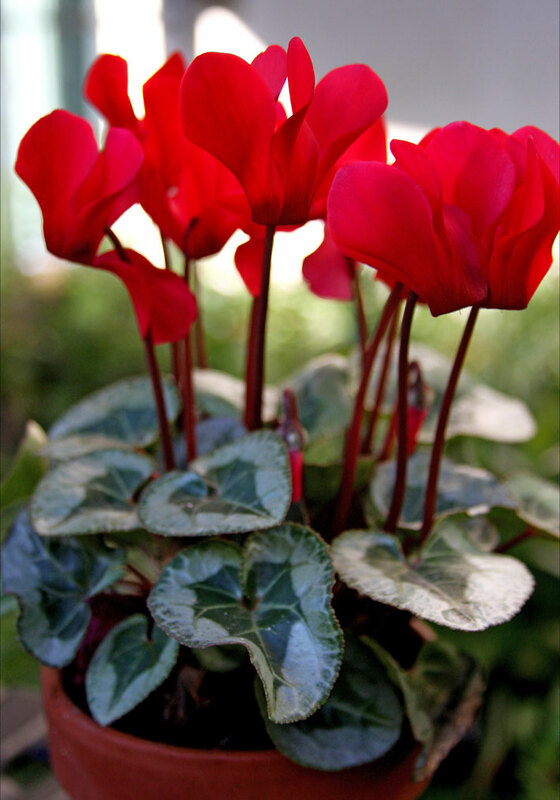 Cyclamen flowers are the primary appeal of these plants as house guests. The leaves which look like miniature lily pad leaves are interesting without a doubt, but can’t compete when compared to the elegance and sheer variety, in both colour and appearance, of the flowers. Whites, pinks, reds or violets are all common, while you can find more unusual flower styles such as doubles or basic singles, Cyclamen persicum with its five upswept petals are the most frequently sold. The flowering season will last a couple of months if conditions are cool, half that if you’ve chosen a warm room. Many plants grown from tubers and corns have a strong concentration of elements that can be quite nasty toxicity wise. If a child or pet mistakes a Cyclamen tuber or corn for a treat and eats it you must seek expert help imnmediatly. 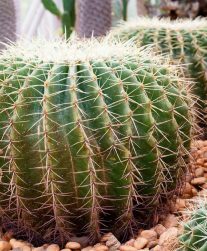 Prevention is better than cure, so it might be worth avoiding these plants in your home if you know your pet or child is curious about houseplants. Once your Cyclamen goes dormant (Spring) store the tuber or corm in a shady but fairly dry spot in your garden or out building. You can remove it from the pot it’s in, or leave it in situ. From August onwards start to water your tuber a little and increase the light level, i.e. move it from the shady storage location and place on a windowsill for example. If you kept the tuber loose, make sure you repot it back into a pot at this stage. It needs to sit so the top is just above the soil surface. Keep barely moist and all being well new sprouts (if they haven’t already) should start to poke out from the tuber. Water more heavily when the plant is growing more vigorously but not before, otherwise you’ll encourage rotting. This is probably a temperature issue. A Cyclamen will flower and grow during the colder months of the year, they detest heat which is why your never find one growing properly in summer. To keep one successfully indoors you need to mimic the temperature outside and this means choosing a cool location. Perhaps an unheated room or a cool but bright hallway. Yellowing leaves is fine in Spring, but if this is happening earlier then chances are its either been kept somewhere too hot or you’ve over watered and the tuber / corm has started to rot. Caused by the soil being too wet for too long, or exposure to very low temperatures. If the rotting is only on a small section, cut it out. If the rot is more extensive throw the plant into the compost bin as it can’t be saved. Although they don’t like strong direct sunlight, Cyclamens still need quite bright light to fuel its growth. Move to a lighter spot. Deformed leaves and flowers, uneven growth. If you are experiencing lots of undesired symptoms, you may have a dreaded Cyclamen Mite infestation. However this is quite rare so check your treatment is at least close to our care instructions detailed above first, in case you have made mistakes in other ways. The Cyclamen Mite is not possible to see with the human eye, but if you believe you have this pest you will find little help in terms of available chemicals. 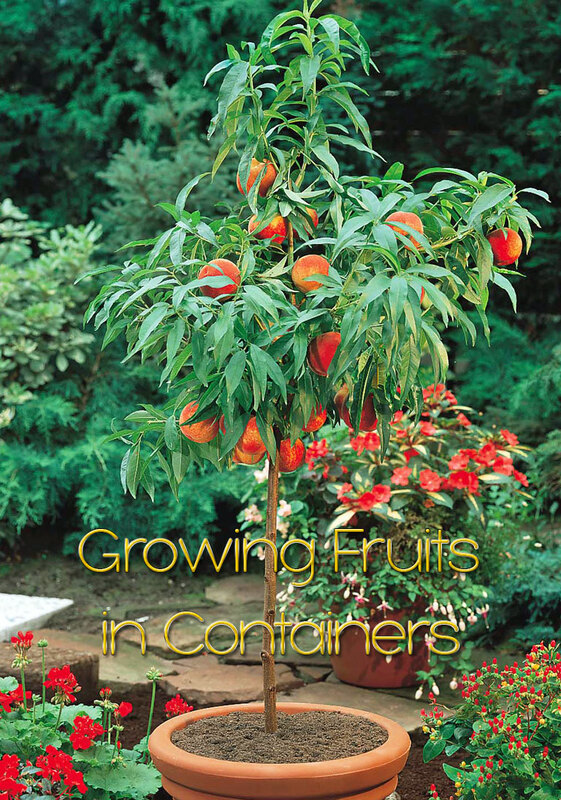 Most are tightly controlled for human safety, so you may need to consider throwing the plant out. Alternatively you can kill the mites by placing the entire plant in hot water for 15 minutes at a temperature of 40ºC / 105ºF.